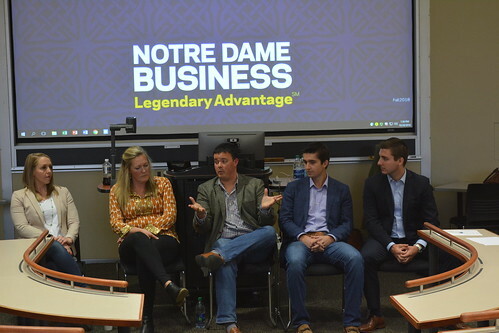 On Sept. 26, Brent Beshore, CEO and founder of adventur.es, hosted a small group discussion “Get In ORBIT: Behind the Curtain of Small Business & Private Equity.” The event was facilitated through NDIGI’s pop-up workshop series, a program designed to inform Notre Dame students of the different career paths within the finance industry. Beshore and four of his adventur.es associates focused the discussion around the non-traditional approach of adventur.es, the establishment of an investment screening process, and the expected growth for the firm. Brent Beshore received a BA in Politics with an emphasis in poverty studies from Washington and Lee University. He went on to attend a JD/MBA program at the University of Missouri. Despite lack of experience in private equity, Beshore purchased his first company when he was 25 years old, which ultimately led to the start of adventur.es. Adventur.es was founded by Beshore in 2007. Headquartered in Columbia, Missouri, adventur.es invests in North American companies with owner earnings of $2-$14 million per year. Committed to the belief that “boring is beautiful,” adventur.es looks to invest in mature and steady family-owned companies. Currently, the firm has a number of specialty companies in its portfolio, including Presidential Pools, TEPCO, MediaCross, Blue Square Manufacturing, Pebble Radiance, and GAME Group. When asked about the adventur.es investment approach, Beshore deferred to Greg Trinkl, a 2018 Notre Dame graduate and Business Associate at adventur.es. He described the firm’s screening technique as “holistic and more of an art than a regimented process.” Adventur.es often prefers to find companies involved in speciality industries, such as glass glazing and pool building. After calculating EBITDA, a business’s income before interest, taxes, depreciation, & amortization, adventur.es evaluates the company’s owner earnings. Given that companies are usually mid-range investments, adventur.es also looks at factors such as ownership, management, and long-term transition goals. In the final investment phase, adventur.es creates a Letter of Intent (LOI), then conducts due diligence. As they continue to grow, adventur.es is investing at a faster rate; on an annual basis adventur.es go under LOI on 4-7 companies. With six companies in its portfolio, adventur.es operates with a small-business mindset focused on excellence. The firm gravitates toward family-owned companies who share adventur.es’ values of transparency and authenticity. The team of 14 enables adventur.es to give an unusual level of individualized attention to each portfolio company. According to Beshore, the firm has no upper-limit for growth, because adventur.es plans to hire proportionally to the number of portfolio companies obtained. By scaling out and getting more employees involved, Beshore believes adventur.es can maintain the integrity of its small-business values. When considering the type of candidates who fit the adventur.es employee profile, Beshore indicated a desire for applicants who have “been in the mud.” The grit, creativity, and enthusiasm of the adventur.es team are the factors that allow the firm to continue its unique identity.